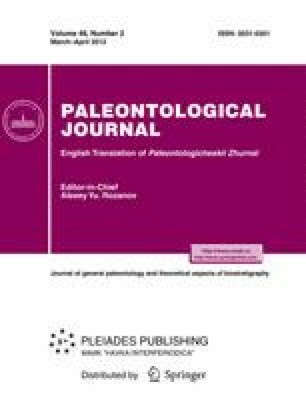 Dicynodontids are the most widespread and diverse group of higher anomodonts in the Late Permian of Eastern Europe. Dicynodon trautscholdi Amalitzky, 1922 is the first dicynodont described in Russia (Amalitzky, 1922). The taxonomic position of this and several closely related forms described by V. P. Amalitzky and P. P. Sushkin (Sushkin, 1926) remains an open question. A reexamination of cranial morphological features in East European members of the family Dicynodontidae allows the assignment of Dicynodon trautscholdi to a new genus, Fortunodon gen. nov., and corroborates the isolated position of Dicynodon amalitzkii established by Sushkin (1926), which is also assigned to the genus Fortunodon gen. nov. Beginning from the Sokolki Assemblage, Late Permian dicynodontids adapted to various ecological niches and had a noticeable effect on the general appearance of the tetrapod fauna. Original Russian Text © A.A. Kurkin, 2012, published in Paleontologicheskii Zhurnal, 2012, No. 2, pp. 78–88.